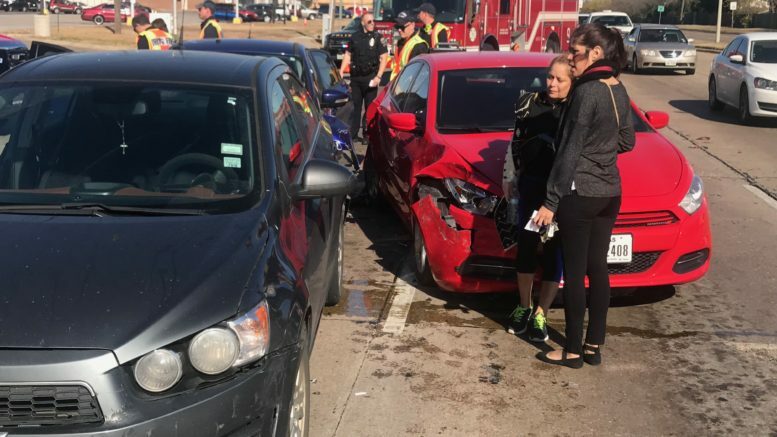 A 3-car pileup occurred on Thursday, November 29th, at approximately 10:40 AM at the corner of Belt Line and Rochelle in Irving. A Gray Chevy, Blue Ford and a Red Dodge were involved. All 3 vehicles were headed southbound on Belt Line. According to eyewitnesses on the scene, it appears there was indecision on whether to stop or go during a light change. 2 Irving PD units, 1 Irving Paramedic unit and 1 Irving Fire Truck were on hand. Only minor injuries were reported.